It’s been six months since I have been to Texas for BBQ. Granted, the Texas State Line is only a few miles from Shreveport, but in order to obtain the good stuff, you usually have to drive awhile. I can’t explain why I love good BBQ, but I use Texas Monthly’s Top 50 as my roadmap. I’m only at number seven. I have forty-three more joints to visit before the new list is released. The list just came out last spring and it is released every five years. It’s going to be tight, but I like a good challenge. Today’s journey was relatively short. 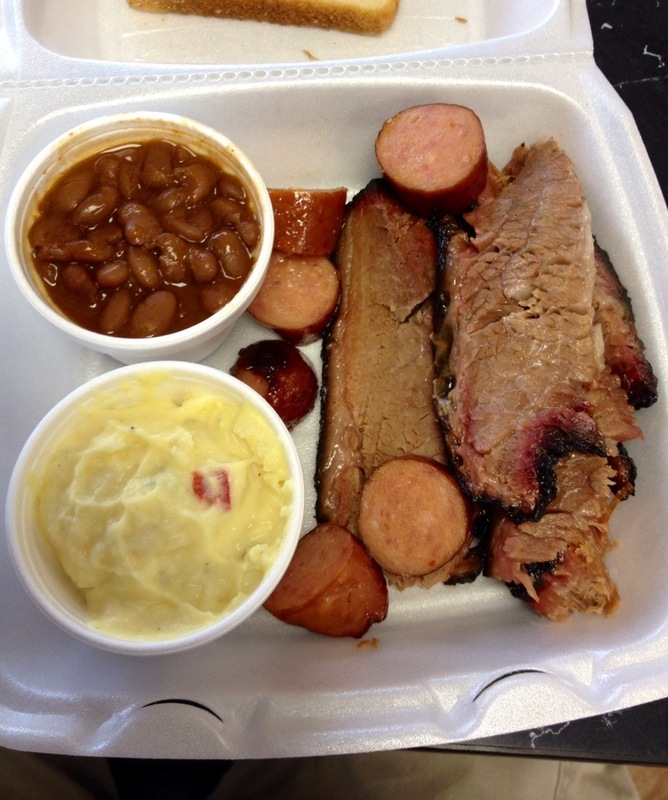 Bob’s Bar-B-Que is in Henderson, TX. It’s only a ninety minute drive to get there. BBQ Turnoff: using a microwave on smoked meat. Bob loses points. I don’t even care using a microwave at home. It tends to sadden meat. Let’s start with the potato salad. I don’t know if it is produced in house or not, but I’m betting it’s store bought. It’s nice and tangy, but so is Kroger’s. Besides, I didn’t drag Alli, my oldest daughter, to eat potato salad. I expect a good smokehouse to have some good beans. I happen to love Ranch Style Beans, so I was in luck. However, I can get beans from a can at home. Punching it up with a little meat and barbecue sauce does not constitute homemade. Points lost for the attempted canned bean fake out. Enough of the sides. Let’s talk turkey. Or brisket in this case. I like to research my restaurants so I know what to expect. TMBBQ has solid advise for this joint. If you don’t want to lose the crust, you have to specifically request the fatty brisket with the crust. If you don’t, the flavor will get chopped away and sent to BBQ limbo. Seriously. I don’t know where they put the flavor after they chop it off the meat. There certainly aren’t any burnt ends in the beans. If you think it’s weird to discard the culinary meaning of life, you’re not alone. It appears that northeast Texas (and north Louisiana for that manner) fear flavor. The food in this area is a bit bland. Not Minnesota bland, but food around here is usually only a notch above truck stop fare. Anyway, the crust had a nice flavor and the fatty brisket was plenty juicy. 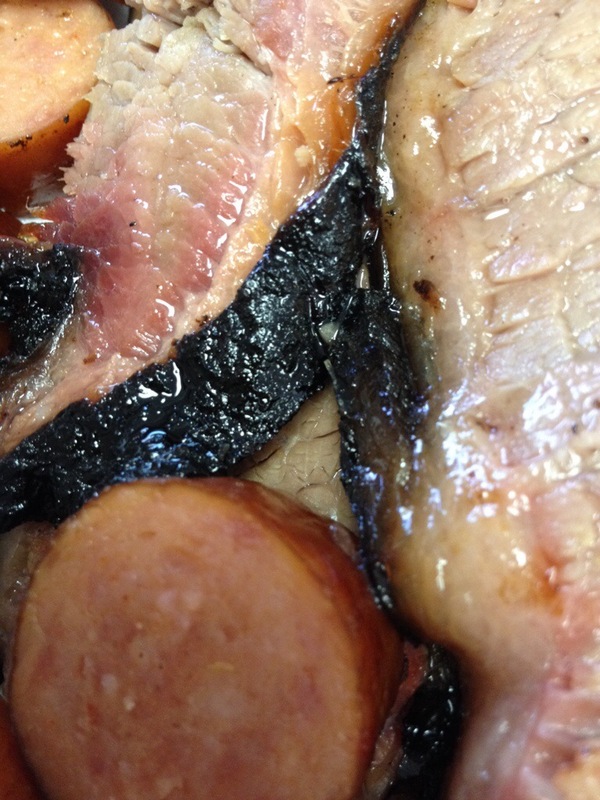 I had a slice of regular brisket and it was like swallowing sawdust. You know, good food. If you travel, you know that good food in one place is synonymous with yucky food elsewhere. The hot link wasn’t fire engine red like I’m used to. It looked and had the consistency of a normal sausage. And it wasn’t hot. My guess is Bob heated up some Earl Campbell (I hope he’s not using that microwave) from Piggly Wiggly. It was good, but I’ve had better. Nice bark. Definitely not crustolicious like Black’s in Lockhart, but this ain’t Lockhart. It’s Henderson. I’m not sorry I forgot to take a picture of the peach cobbler. Cobbler is never very photogenic. I have read that this is homemade. I enjoyed it, but somebody went crazy with the cloves. I go by this rule of thumb: spices are flavor enhancers, not main ingredients. All in all, I had a great time with my daughter. It was a very nice lunch. Texas Monthly was generous by awarding a 4/5. It topped out at 3.0/5.0, but it is good enough for a lunchtime jaunt.